The museum created a Thornbury Heritage Trail to mark the new millennium. The Heritage Trail follows an easy pedestrian route around the historic town centre, with an optional return along country footpaths. The way-marked route starts outside the Town Hall in the High Street. A bronze relief sculpture of the centre of Thornbury, The Spirit of Thornbury, is located there too. Additional historic sites bear a bronze plaque. The route follows a way-marked figure-of-eight path in two sections. You can follow the two sections on different occasions if you like. The volunteer staff of the museum have, over the last couple of years, updated and upgraded the Heritage Trail information boards and the Trail Guide. These incorporate changes to the town since the Trail was established. The new Heritage Trail Guide, published in 2017, can be bought from the Museum or the Town Hall. The Trail is defined on the ground by bronze plaques incorporating a Trail Logo. These are set in the pavement and show the direction to follow. Along country footpaths they are set into wooden posts. The Heritage Trail Guide booklet gives detailed information about every stage of the Trail. Selected key sites are enhanced by landscape features, designed to illustrate specific aspects of the town’s history. A bronze relief map of Thornbury was the last feature to be installed, in the High Street, and contains the Millennium time capsules, prepared by the schools of Thornbury in 2000. 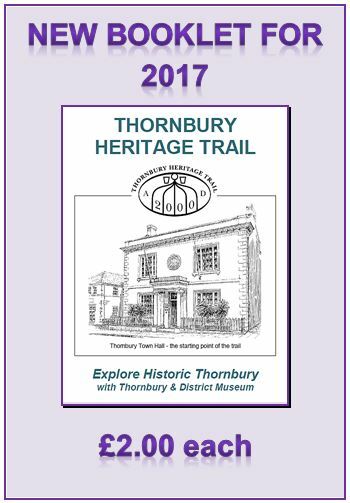 BRAND NEW for 2017 – a 28-page Guide to the Thornbury Heritage Trail – for just £2! The new Heritage Trail Guide booklets can now be bought in the museum shop. Snap one up now! 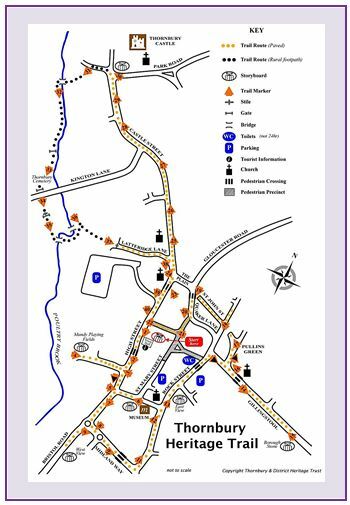 It’s packed with information and we think you’ll find something you didn’t know about Thornbury on almost every page. Click here to obtain a pdf version of the Trail Map, which you can print off at A4 size to accompany the Trail Guide. Just pop into the museum next time you’re passing and one of our front-desk volunteers will be happy to sell you a copy for £2! You can amaze your friends by being extremely knowledgeable about different buildings throughout Thornbury.